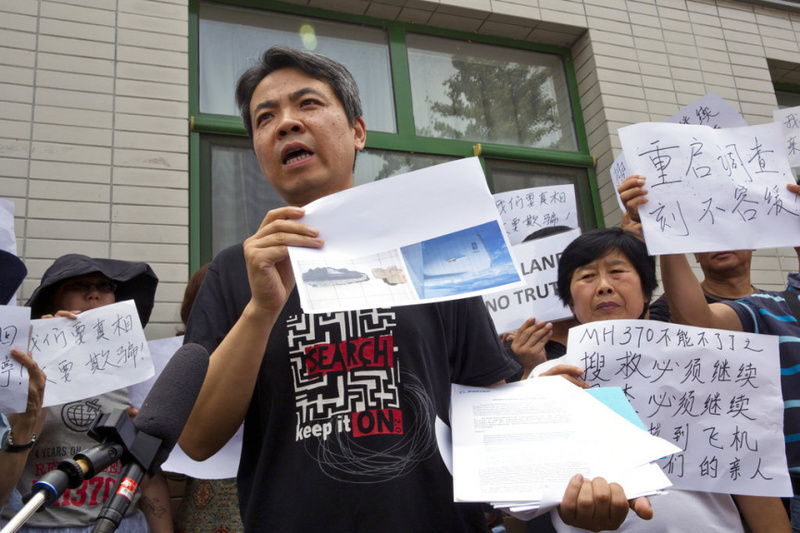 BEIJING (AP) — Relatives of Chinese passengers who were aboard missing Malaysia Airlines Flight 370 said Friday they refuse to accept the latest report on the plane's disappearance four years ago and demand the search be restarted. About 100 relatives gathered in Beijing to hear chief investigator Kok Soo Chon discuss the report prepared by a 19-member international team. It reiterated Malaysia's assertion that the plane was deliberately diverted and flown for over seven hours after severing communications. But it said the cause of the disappearance cannot be determined until the wreckage and the plane's black boxes are found. Some relatives held up banners and chanted that they would "never give up before seeing our next of kin." Chinese citizens made up 152 of the 227 passengers on board the March 8, 2014, flight from Kuala Lumpur, Malaysia, to Beijing. Twelve crew members were also on the plane. Jiang Hui, whose mother was aboard the flight, said she was unhappy with the report's methods. "As we see it, this is not a sufficient report in respects to the conclusions, the details of the information, and the measures and technical tools that Malaysia applied, as well as the way Malaysia implemented their obligations," Jiang said. Wen Wancheng, whose son and grandson were on the plane, said Malaysia should appoint a new investigative team, while Li Eryou, whose son was aboard the flight, said the Chinese government also owed the relatives an explanation as to what happened. They echoed the complaints of some Malaysian relatives, who argued that the scope of the safety investigation was too limited, depended too much on information supplied to the investigators by other parties rather than on their own probe, and didn't discuss the scope of the searches. The report said there was no evidence of abnormal behavior or stress in the two pilots that could lead them to hijack the plane but all passengers were also cleared by police and had no pilot training. However, it also did not rule out unlawful interference by a third party, such as someone holding the pilots hostage, although no evidence has been found to support such a possibility. The investigation showed lapses by air traffic control, including a failure to swiftly initiate an emergency response and monitor radar continuously, relying too much on information from Malaysia Airlines and not getting in touch with the military for help. Malaysia's government has said it is open to resume searching if credible evidence of the plane's location emerges.